The third volume in the AOCS PRESS MONOGRAPH SERIES ON OILSEEDS is a unique blend of information focusing on edible oils. These oils contain either unique flavor components that have lead to their being considered "gourmet oils," or contain unique health-promoting chemical components. 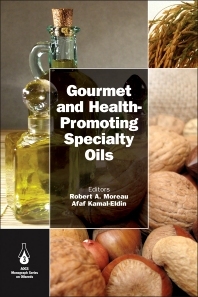 Each chapter covers processing, edible and non-edible applications, lipids, health benefits, and more related to each type of oil. Robert A. Moreau was born in Massachusetts. He obtained his BA at Boston University and his Ph.D. at the University of South Carolina (Ph.D.), where he was mentored by Dr. Anthony Huang. After a two year postdoc with Dr. Paul Stumpf at UC Davis, he joined the staff at the Eastern Regional Research Center (USDA, ARS) in Wyndmoor, PA, USA where he has been a happy lipid researcher for the last 28 years. Bob's research interests have focused on method development for lipid analysis and their use to solve problems in agriculture and food science, including functional lipids such as phytosterols, tocotrienols, and carotenoids. Afaf Kamal-Eldin is a professor of food science at the United Arab Emirates University in Al-Ain, UAE. Her major specialty is on the chemistry, biochemistry and nutrition related to bioactive compounds and to food chemistry in general. She is a member of the editorial boards of a number of journals and has edited/co-edited four books published by the American Oil Chemists’ Society press. She has published 150 original publications and 30 reviews and book chapters in addition to a large number of conference abstracts. Afaf is conducting research and teaching in the area of food for health and has supervised a large number of M.Sc. and Ph.D. theses. Afaf Kamal-Eldin, United Arab Emirates University, Al-Ain, UAE.